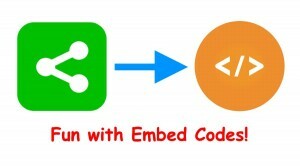 You have probably encountered embed codes before, but they may seem like a bit of a mystery. An embed code is, in short, a bit of HTML that allows you to embed part of another web site on your own – like a YouTube video, for example. Embed codes come in two general flavors these days, and each has its strengths and weaknesses. So, how do embed codes work? Why are some hugemongous, and others teeny-tiny? Are iframe tags really the spawn of the devil? Much has been said about iframes, and they have been the topic of heated debate. You can simply think of an iframe as a picture frame that you hang on your wall. In this case, your wall is your web site, and the picture frame is the iframe code. You can load the “embed” URL in your browser if you’d like. You’ll simply get a full-screen version of the video. In fact, that’s where the iframe’s other HTML attributes come in. The width attribute says you want the picture frame on your web site to be 560 pixels wide, and the height attribute says the frame should be 315 pixels tall. The frameborder=”0″ part means don’t display the pictures with a frame (em, border), and allowfullscreen tells you browser that it’s okay to allow the picture frame to temporarily maximize the video embed when you click the “Full Screen” button on the YouTube video. In other words, iframes aren’t magical. They’re just a way to include a link to some other content, and have that content show up in a frame on your site. It may seem dangerous to take someone else’s web site (or part of it) and plop it inside your own, but it isn’t supposed to be… I say that because according to the specs, iframes are supposed to be isolated from their parent page. Put another way, if you embed my site on your blog in an iframe, the reader’s browser should treat the content of the iframe (my site) as a totally different window or tab – just as if you’d loaded the 2 URLs in different tabs yourself. Unfortunately, that’s not how it works in practice. There is nothing inherently wrong with the idea of an iframe, but they are only as safe as the people who program our browsers make them. But generally speaking, nowadays you shouldn’t have many fears about iframes. iframes are, like, so Yesterday! No, they aren’t. If iframes were “yesterday’s technology”, then YouTube certainly wouldn’t be using them. But, guess what? They are using iframes! That’s because they’re smart. Oh, Twitter… Will you ever get it right? Probably not. I can dream, though. The Health and Wellness Show - 25 May 2015 - Detox Prot... on SOTT Radio Network will air 05/25. It works like this: The embed code is actually basic HTML, which of course you can style a bit with CSS on your own site if you wish. This way, even before the embedded tweet is fully loaded, it’s still functional: there is text, links, etc. 1. The embedded HTML code (before the Twitter JS runs) is now included statically on your web site. What happens if it changes? Too bad for you! 2. The inclusion of script tags that load JS directly from Twitter is kind of a no-no. Any JS you load like that on your site has access to everything else on the page, including other JS code, the DOM, everything… So, if you’re going to use JS-based embed codes like this on your site, you better be darn sure you can trust the site you’re getting them from! Recall that with in iframe, the remote embed content is more or less isolated from your page, since it’s just a picture hanging on the wall. The picture can’t modify the wall. With Twitter-like embed codes, the picture can do anything it wants with the wall, including painting it a different color, removing or hiding other content, etc. 3. The above Twitter embed code is frickin’ huge and complicated – unnecessarily so… and that’s a short Twitter embed. Some of them are 3 times longer. That’s just nuts, and totally inefficient. 4. Following on #3, think about the YouTube iframe embed. It’s just a URL with a video ID number. What if YouTube wants to totally change the embedded video content, or the look and feel? No problem! Since the iframe is simply loading a URL pointing to their site, they just change their site. Bam, done. Your embedded video “updates itself”. And, when you think about it, how hard would it have been for Twitter to just make a simple iframe with a URL that basically just included the above tweet embed inside an HTML page wrapper? Not hard at all… And then a Twitter embed would have been as short and simple as a YouTube embed, easily and 100% modifiable by Twitter, and the world would have been much happier. 5. Block-level tags like DIV and BLOCKQUOTE are treated differently by browsers than are iframes. This can cause certain headaches – for example with styling, layout, and rendering. 6. Related to #5, if you’ve ever written your own WYSIWYG editor for a web site, you know that dealing with Twitter-like embed codes is a nightmare – at least in comparison to dealing with YouTube-like iframe embeds. You don’t see these much any more in the wild, since the iframe technique allows YouTube (for example) to decide whether you get an HTML5 video, or a flash-based video… And all the Long Embed Code Insanity is totally hidden from you! Nice. Well, there you have it. That’s what an embed code is, and that’s how the most popular variants work. Despite the ridiculous and often unnecessary complexity involved, hopefully you now have a better idea of exactly what’s going on with embed codes!